I posted the first blog last night, so when I said “come back later in the day,” I think I was running on a different timetable. Either that, or I’m just impatient. Or, potentially fearful that I will forget to update the site with the art I promised you. So here it is. Here’s the artwork I did for a recent local coloring contest! I probably have to explain what this is about. 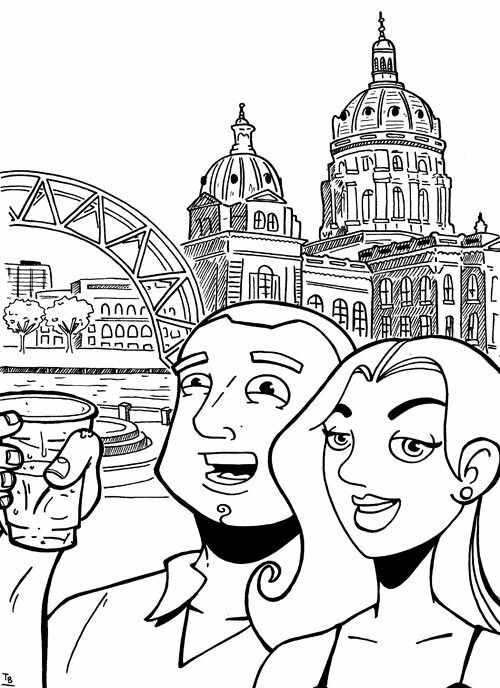 Y’see, my editor over at Juice – a weekly publication created by writers of The Des Moines Register and aimed at the 20-something set – asked me if I would be interested in producing some artwork for a coloring contest they were running called “Summer Fun in Des Moines.” I jumped at the chance. I would have done it just to have something to do. But it didn’t hurt that they were paying me extra for it. I was stuck for ideas for the longest time, though. See, even though it’s a coloring contest, IT’S NOT FOR KIDS! So I had to think of something appropriately “adult” without crossing the line into anything vulgar. I asked my editor for suggestions and he said, “People socializing. You know, drinking.” This is not an unreasonable request for Juice. They often go around to all the social events in the city and take pictures of people out having a good time. Then they post them on their web site. I felt a little funny about drawing cartoons of people drinking, but I think what I came up with is open to interpretation. I really like how the girl turned out in this one. I tried something different with how I draw eyes and it worked. I also went a little more cartoony for the man’s jaw line. You see that kind of style a lot now, but it’s hard to get my brain to tell my hand to do that. So I thought that was a minor accomplishment. The land marks in the background are the Simon Estes Amphitheater and the state Capitol. The Simon Estes Amphitheater is basically this metal arch over a concrete pavilion next to the Des Moines River where they have a lot of concert performances in the summer. Simon Estes is an opera singer and probably the most cultured celebrity we have, so they trot him out for all kinds of stuff. The Capitol building is, well, a Capitol building. But I think it’s an amazing piece of architecture. I’ve been to a few other state capitals and they don’t inspire anything in me like this building does. The domes are gold leaf! Anyway, that’s probably more Iowa history than you care about. I just wanted to show you guys some artwork I was proud of. Hope you liked it! Apr 18, 2005 ATTENTION: IMPORTANT ANNOUNCEMENT! Sep 9, 2002 I’M FAMOUS! Apr 15, 2005 ATTENTION: IMPORTANT ANNOUNCEMENT!